A big aesthetic consideration in your kitchen is your choice of countertop. There are many options to choose from, but mostly it’s going to come down to 2 deciding factors: functionality and cost. BTW, check out our Kitchen Design Ideas section if you need more design inspiration. The different activities in a kitchen will determine which countertops are most suitable. A very busy kitchen where hygiene is the highest priority, will do great with stainless steel tops. A baker’s kitchen on the other hand will need a marble work surface, while a family friendly kitchen needs durable finishes like solid surfacing or engineered stone. A second consideration under functionality is your choice of sink. Some surfaces, like marble, granite and quartz can successfully accommodate an undermount sink. If you are considering an integrated sink, then you will need to choose solid surfacing or concrete. Natural stone can also be fashioned into integrated sinks by joining slabs together. This is an especially popular solution with soapstone. If budget is your most important consideration, then postform tops are going to be most suitable: they are easy to order and simple enough to install by a DIY enthusiast. Concrete is another affordable option, but is best done by a professional. On the opposite side of the scale, is natural stone like marble, granite and soap stone, and some specialist finishes like copper and brass. Beautiful and elegant, marble countertops are durable and can add significant value to your home. There is a big variety of colours available and with the correct sealant, your tops will look great for many years. Marble is easily damaged by acids, so care should be taken with acidic foods like citrus and coffee, and certain cleaning products with a high acid content. Another natural stone product, granite is highly durable and versatile although it is necessary to be sealed every year to protect the surface from damage. The tops can be matte or gloss to suit the style of your kitchen. This dark stone has gained massive popularity in recent years. It is highly resistant to stains, scratches and acids and therefore makes an ideal material for kitchen countertops. Regular oiling with mineral oil is necessary to maintain is beauty – the oil will also deepen its colour over time. Quartz in manufactured by compressing natural quartz and resin. This man-made product has many great qualities: it is non-porous, stain- and scratch resistant and will last many years with virtually no maintenance. Their only drawback is that they are not entirely heat proof and can be damaged by hot cookware or appliances. Brand names include Ceasarstone®, Zodiac® and Silestone®. Another man-made countertop material, solid surfacing like Corian®, Formica® and Staron® are highly durable, scratch resistant, and allows completely seamless countertops. Where scratches or other damage occur, it can be buffed out which allows them to look like new for a very long time. These products also usually come with extensive guarantees that further emphasize their lifespan. Traditionally used in industrial kitchens for their superior anti-bacterial and hygienic properties, stainless steel tops have now become a very popular choice in modern kitchens. They are easy to clean, have high stain resistance and are heat proof. On the down-side, they are prone to scratching over time and easily show fingerprints. A beautiful and warm choice, wooden countertops have been an integral part of traditional kitchens for many years. Solid worktops are not often used because of the possibility of the wood warping, but assembled wood, or butcherblock, is a great option that is both durable and stable. It can be used directly as a cutting surface, but these cut marks could become a problem with collecting bacteria. Wooden tops are not resistant to stains, water or heat damage, but most of these can be sanded away and resealed to bring the top back to its former beauty. Laminates have come a long way since they were first introduced to the kitchen environment more than 100 years ago. The HPL’s like Formica® that is available today is highly durable, stain-, scratch- and heat resistant and come in such a big variety of designs that there is something to complement every kitchen. Because the core of HPL’s are made with woodchip or wood fibre, they can absorb moisture and warp if they are not properly sealed around sinks and taps. Another fairly recent addition to domestic kitchen finishes, concrete is durable, scratch-, heat and stain resistant. Because it is purpose made for a specific kitchen, it does allow a lot of customization: the concrete can be coloured of left natural, splashbacks can be cast with the tops and integrated sinks can also form part of the design. To ensure that you choose the right countertop for your kitchen, determine what functionality you need from your countertops and then choose the best one you can afford. For assistance, contact one of our friendly designers who will be happy to assist. If you would like to get expert advice on designing a Kitchen for your family, why not Book a Design Appointment or Visit our Showrooms. If you enjoyed our design ideas, subscribe for updates. Get kitchens design ideas in your inbox. Check out these posts for more Kitchen Design Ideas. What is Great Kitchen Design? 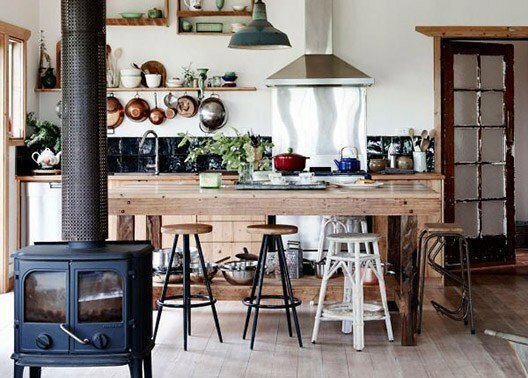 What are Shaker Kitchens and Where are They From? What Exactly are Hand Painted Kitchens? How Much Value Does a Fitted Kitchen Add to Your Home? Get the Perfect Kitchen Finish for your Lifestyle! Use this tool to get an instant price estimate for your kitchen based on layout, number of cabinets, type, layout, worktop, carcass material and appliances. Get More Kitchen Design Ideas in your Inbox! Beautiful Kitchens, Extreme Levels of Kitchen Design Customisation and Outstanding Service. Prices range from €5,000 to €50,000 and include a 10 Year Guarantee & fitting by our team of experienced fitters.